I am not sure who came out with the idea of expelling fireballs from some granite towers along the tranquil Yarra River. I am not even sure whether I should call that a splendid display of flames, or frown upon it in dismay. The first time when I stumbled upon the fiery performance, the sudden angry roar emanated from the innocent-looking rectangular structure gave me a shock in my life. 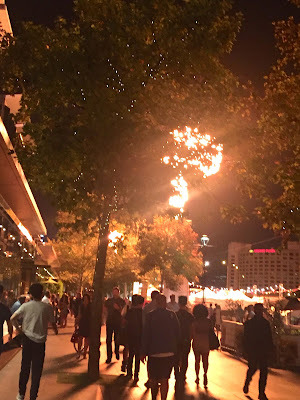 The second time occurred when I was strolling along the beautiful Yarra River enjoying the urban starry night, when a giant scorching hot fireball leaped out from nowhere and interrupted my peaceful train of (supposedly romantic) thought, and left a heated burning sensation at the the top of my skin. The Melbourne night sky turned into a sudden surge of furious orange instantly, like a black hole being greedily swallowed up by a fearsome dragon emerged from the dungeon of granite. The fire show received mixed reception from the Melbournians. Some see it as a marvelous view and take pride of the fact of it being the world’s largest fireball ever spewed into a night’s sky. Some call it an “abomination” and see it as a real disgrace to Melbourne for contributing to the wastage of energy and fossil fuels. Regardless of your opinion, the fire show is here to stay, at least for some time.